Ireland's Official Easter Rising 50th Anniversary Coin! In 1966 we saw the 50th anniversary of the Easter Rising, and to mart this occasion the very first Irish commemorative coin was struck. 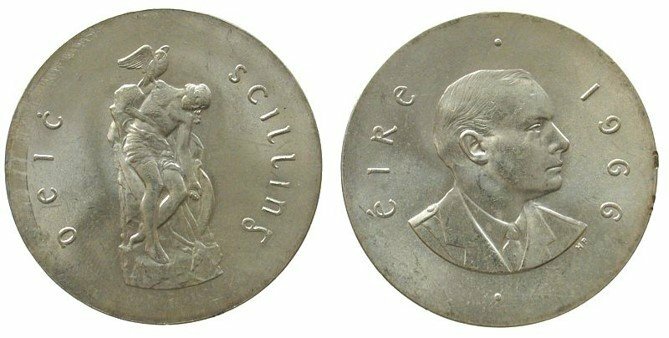 The 1966 Ten Shilling Silver Coin features the portrait of Pádraig Pearse facing right, and is the only Irish circulating coin to depict the bust of anyone associated with Irish history or politics. The reverse design shows the famous statue of Irish mythical hero Cú Chulainn that resides in the GPO in remembrance of the Seven Signatories. Struck in solid silver, this coin is the only Irish coin to have concave striking, meaning the coin dips in the centre on both faces. Only two million coins were struck in 1966, however it was quickly replaced by the new ten shilling banknote and was removed from circulation. That same year 1,250,000 of the coins were melted down for the silver, with many more being melted for the silver content since making these one year strike coins very sought after by collectors not just in Ireland, but the world over. Your coin comes encapsulated in a display box, and will be accompanied with a certificate of authenticity.